You will earn 2,852 Reward Points. Earn 1 reward point for every 1 dollar spent. 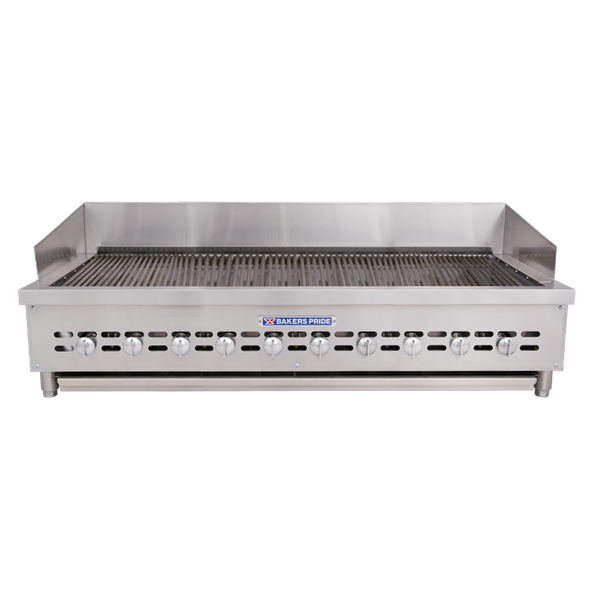 High performance countertop gas radiant charbroilers with exceptionally low profile is only 13 ¼” (337mm) to broiling surface making the XXE series broilers ideal for use on refrigerated cabinets while a 24” deep broiling surface provides the largest broiling area and production capacity in its class. Exterior is all stainless steel with unique air blanket for ventilation and cooler outer temperatures. Interior combustion chamber is fabricated of 11 gauge and 16 gauge HRS and hand welded to from a single unitized body. 14 gauge, 300 series stainless steel radiant heat deflectors placed directly above each burner for even heat transfer to the broiling surface, while cast iron radiants are optional. Standard top grates are cast iron with channels to direct grease to front trough. Each grate may be manually adjusted in any of three separate tilting positions. Additional Fish grates, per 10-1/2" +$109.72 Additional Flat/cast iron grates, per 6" +$109.72 Additional Floating rod grates, per 6" +$109.72 Additional Griddle plates, in-line - 10-1/2" wide +$1,204.35 Additional Meat grates, per 6" +$109.72 Fish grates in lieu of standard, per 10-1/2" Floating rod grates, per 6" in lieu of standard Griddle plate, in-line - 10-1/2" wide, in lieu of standard grate +$1,128.22 Griddle plate, lift-off - 10-1/2" wide +$364.35 Griddle plate, lift-off - 16" wide +$288.75 Meat grates in lieu of standard, per 6"